Thes pics come from a Spanish site. They originate from the Outdoors dept. of the Caïro Museum. No further explanation was given. I don't recall ever having seen a similar statue. It appears to be large (about 3m high?) and made of a hard stone, like granite. The thing that interested me is the woman behind the man: very close, very 3D, in a pose of blessing. I'd guess it concerns a goddess - she seems to wear an uraeus too btw. Anyway, I haven't often seen a statue where u actually have to look at sideways to distinguish one of the models. Dating it, I'd say it goes from the age of Ramesses up to the Late Period. Does anyone know more about it? No, I don't know anything about it, but it really is an interesting piece. 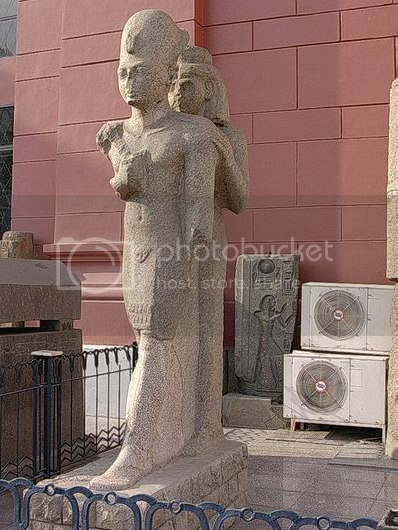 I too haven't seen a staue where the lady is stood behind a pharaoh like that. The way the lady's hands are placed it looks like very protective gestures (like those of a wife or goddess): you often see stances like that on temple/tomb walls and maybe even in papyri, but not in statues. I hope someone knows more about it. 1. The standard/pillar behind the woman stands further from both models than you can see on the first pictures. It's inscribed as well, so a provenance could be easier to find, if anyone ever studied those. Next to senility I'm starting to suffer from blindness too. That pillar has nothing to do with the figures. The male's face is rather Ramesside, isn't it? A very peculiar statue, indeed. I would have to agree with you folks that the placement of the female figure's hands is important: the right hand up behind the male's head seems like a blessing and the left hand on his shoulder seems protective. I've never seen anything quite like this from ancient Egypt. I also noticed the left, extended foot of the king-figure in this photo shared by Aset. He almost looks to be wearing a slipper or shoe, which strikes me as unusual. Is that just a play of light and am I seeing it wrong? It's not the way you typically see Egyptian figures, is it? He almost looks to be wearing a slipper or shoe, which strikes me as unusual. Is that just a play of light and am I seeing it wrong? It's not the way you typically see Egyptian figures, is it? It looks like a sandal to me. 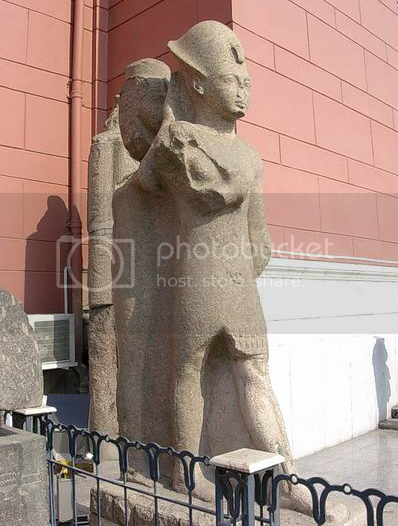 I have read that sometimes in Ptolemaic and Roman periods pharaohs and gods were sometimes depicted in a slightly more Graeco-Roman style, so maybe if this statue was re-used in later times, the footware could've been altered slightly?? The male's face is rather Ramesside, isn't it? I agree, but I'd leave in a margin for "renaissance periods" where earlier styles got copied. In the Saïte Renaissance basalt, schist and "grauwak" (Dutch word for it, sorry) were most popular. 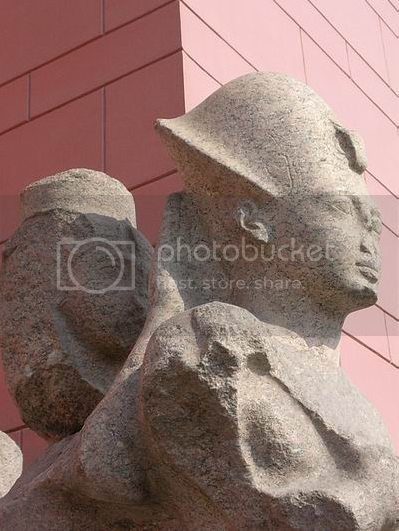 In the Kushite Renaissance before that, basalt and dark granites were most often used too. Probably because people then prefered a shiny, polished touch in statuary. And I know only few renaissance statues, being carved from the actual "old" materials. Also the pleading of the skirt and the facial features on the pharaoh seem to point to a Ramesside origin. But you can never be too sure. Forgot this: the foot isn't "real". I think it's a prosthetic leg, to keep the statue up. Plastic Reconstruction © Egyptian Authorities. Same happened to a piece of the throat. Ah, that would make sense. I thought it looked odd. Re-examining the photo I can now see that large chunk from the knee down where it must have been restored. They definitely did a fine job there. The leg follows the plead in the King's skirt. even if it is a Ramesside king, his features don't look familiar. Not like I knew them all personally, but this one really doesn't ring a bell. Maybe someone knows of a different source to trace Caïro's treasures? For a fortune has no savour if one is gloomy. This is interesting to me. At first, it looked to be unfinished. It must be really old. I wonder how they found it. 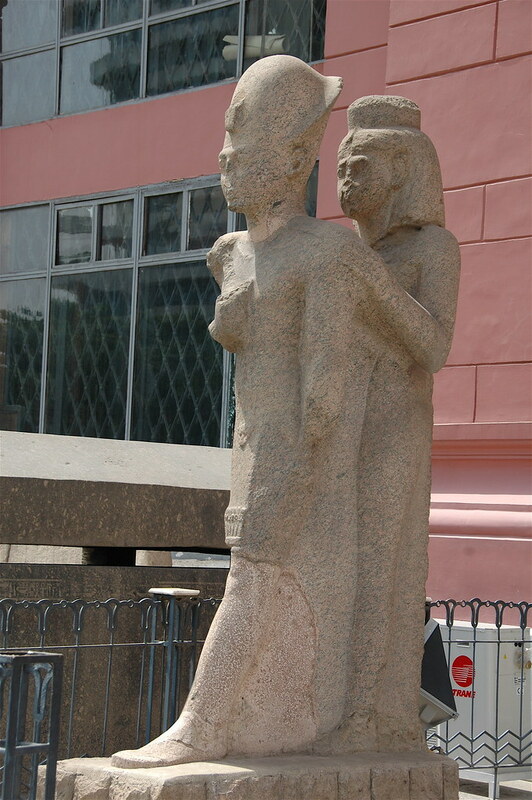 Mohammed Saleh : Varia from the Egyptian Museum in Cairo. - In: Stationen - Beiträge zur Kulturgeschichte Ägyptens, Rainer Stadelmann gewidmet. - Mainz : Philipp von Zabern, 1998. - pp. 353 - 361, pl. 17 - 19. If the women in his back is a goddess (Mut? Anat?) or one of his wifes seems not clear / disputed.